Definition at line 40 of file Registry.h. Definition at line 42 of file Registry.h. Definition at line 47 of file Registry.h. The "declaration" of the matcher, with type information. Definition at line 55 of file Registry.h. Referenced by clang::ast_matchers::dynamic::Parser::ScopedContextEntry::nextArg(), and operator==(). 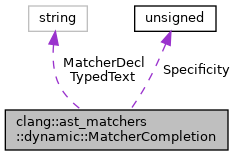 Value corresponding to the "specificity" of the converted matcher. Zero specificity indicates that this conversion would produce a trivial matcher that will either always or never match. Such matchers are excluded from code completion results. Definition at line 62 of file Registry.h. The text to type to select this matcher. Definition at line 52 of file Registry.h.